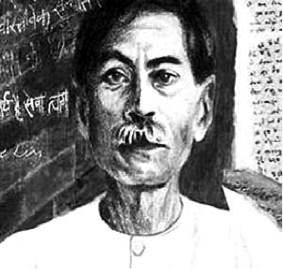 One of the most famous and celebrated novelists in India, Munshi Premchand was born as Dhanpat Rai Srivastav 31st July 1880 in Lamahi in Northern India. He was the fourth child of a post office clerk father, Ajaib Lal and Anandi Devi. He had one surviving sister; two of his siblings died in infancy. By the time he was fifteen or sixteen years old both his parents had died, his mother when he was just seven. His father re-married but Premchand’s relationship with his step-mother was not an affectionate one. The step-mother theme would later feature in his work. Premchand had been through an arranged marriage, as was the custom, but it was unsuccessful and by the time he was nineteen years old it was over. He married young widow Shrivrani Devi in 1906. He was now responsible for supporting his wife, step-mother and siblings and so began working as a schoolteacher in several schools. He worked his way up to be headmaster of a school in a town near Allahabad, and then went on to be deputy sub-inspector of schools in Kanpur. It was in Allahabad that he started writing seriously, using the name Nawab Rai. His first novella, Asrar-e-Ma’abid, was published as a series in an Urdu weekly from 1903 to 1905. The premise of the story was corruption among temple priests and the exploitation of poor women. It was not well received though, with critics calling it “immature; not well organised and without a good plot”. His work often exposed religion as a tool used by the powerful to exploit the weak and regularly wrote about themes such as child widowhood, prostitution, poverty and colonialism. In 1905 Premchand, inspired by the nationalist movement, published an article criticising the Indian National Congress leader’s methods for seeking political freedom and urged more extremist methods. Many of his early stories were influenced by the independence movement and in 1907 he published a story, The Most Precious Jewel in the World, the jewel of the story being the last drop of blood necessary to gain independence. Later in 1907 the collection of stories which established Premchand as a writer of note was published. Entitled Soz-e-Watan, it was banned by British officials for its message of rebellion against Imperial rule. Many copies were burned. Consequentially he changed his pen-name from Nawab Rai to Premchand. In 1914 he started writing in Hindi, believing that social realism was the way forward for Hindi literature rather than the feminine, emotional quality of the fantasy stories it was known for. Premchand was quoted as saying “beauty doesn’t need ornaments. Softness can’t bear the weight of ornaments.” He went on to translate many classic books into Hindi. In 1919 Premchand had obtained a BA degree and was deputy Inspector of Schools. In 1921 he attended a meeting in which Mahatma Ghandi asked people in government jobs to resign from their posts as part of the no-cooperation movement. Even though in poor health and with a family to support he went ahead and left his job. He moved to Benares and established a printing and publishing business in 1923. He also landed a job as a script-writer in the Hindi film industry. Unfortunately despite this and the continuation of a very successful writing career his life was lived in poverty. Increasing sickness led to his death on 8th October 1936.